The first step in calculating your property tax is knowing and understanding your assessment. The value that your property is assessed at is determined by SAMA (Saskatchewan Asset Management Agency). To learn more about what an assessment notice is and how to read one, please click here. Assessment Notices are only sent to property owners when they have purchased land, built or renovated a structure, or demolished a building. To view the assessment of your property simply visit www.sama.sk.ca, click map search and you can search for your property. 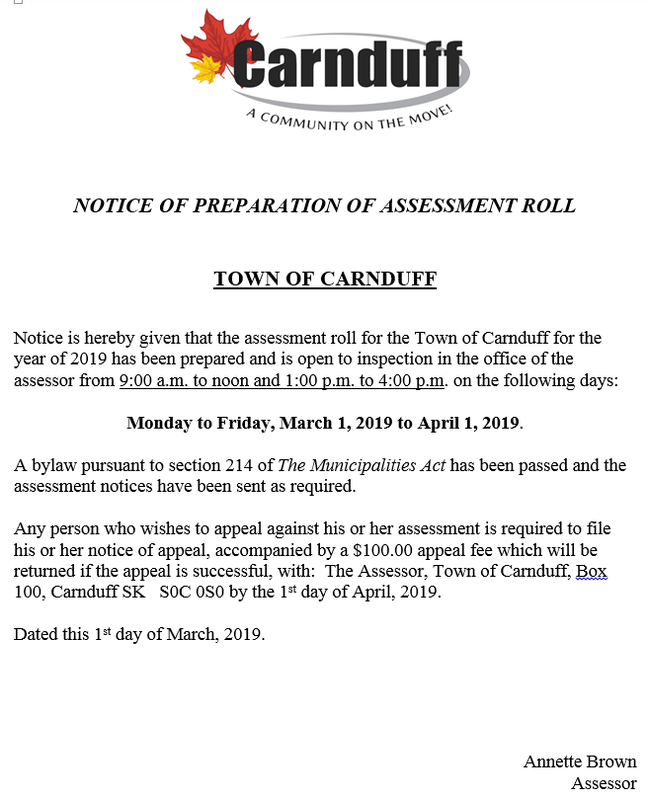 Property Taxes are generally levied in the Town of Carnduff in the month of May. Sally Sue's Assessment for her property is 163,400. Total 2017 Taxes for Sally Sue's property is ($2,127.14 + $673.21) $2,800.35. XYZ Construction Assessment for their property is 163,400. Total 2016 Property Taxes for XYZ Construction is ($2,127.14 + $1,024.52) $3,151.66.